This is the forth block I've made as part of the Sugar Block of the Month Club. I love that a sunshine design was the block for April, when we are getting so much snow in Denver, Colorado. I also love how nice and easy it is to do one quilt block a month. 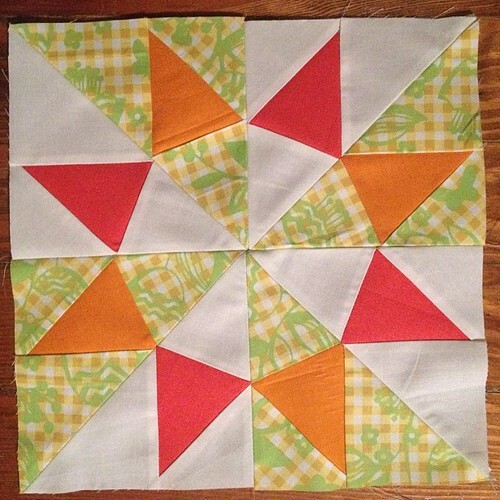 Although I have a couple baby quilts to make, I will plan to take a long time when making a bigger quilt. I hate it when sewing gets stressful, because it's supposed to be my stress release. But as with everything, I've notice it is easy to get overextended, so anyway, being part of a block of the month club has demonstrated to me that one block a month is a good overall strategy for future quilt planning. Another time-management strategy I've put in place recently is to take pictures with my iPhone for immediate upload and wait to take pictures with my professional camera for bigger project or until I really have time for the downloading, processing, saving, and uploading that's required with a larger camera. The quality of the pictures aren't as good, but I'll trade that for the extra quality time I get in other areas of life, like watching my 20-month-old grow like a weed, spending time outside, etc. Kids Clothes Week Project Complete and Broken In! Kids Clothes Week - Work in Progress!